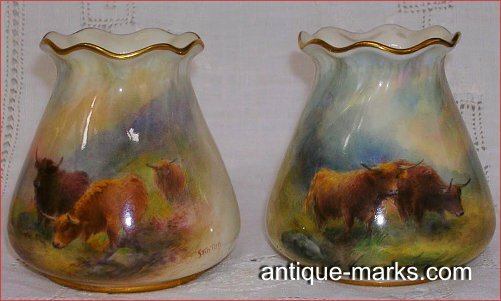 I inherited a pair of Royal Worcester posy vases with hand painted highland cattle that are each signed Stinton. 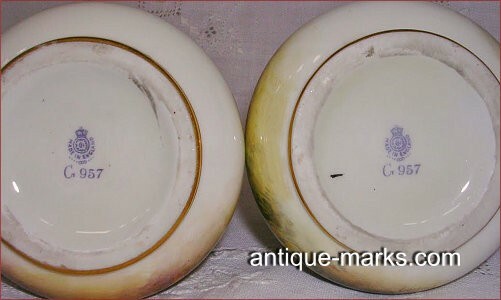 They are lovely and I have been looking for someone who is willing to help me and look at the hallmarks, which are unusual, and tell me if you have ever seen Royal Worcester marks that are similar. I received them from my Grandparents, who were wealthy and traveled the world in the 1930’s and 40’s. I actually took the vases to an Antiques Roadshow event, but it was very late on a very hot day and the appraiser took very little time to look at them. Actually, at the time I had not noticed the difference in the marks, so did not ask them to have a closer look. The whole thing was over in less than 2 minutes. I have also written to Royal Worcester in England and got no reply, and to Christie’s Auction house; they did not consider them of enough value to put up for auction so declined to go further. So, I am continuing to try to find a knowledgeable person who will at least look at them and tell me if they are, in fact, Harry Stinton painted and Royal Worcester; or direct me to someone who can help. I have attached some pictures, I hope you will have time to help me. Hi Kristine, Having looked closely at your images I would say that based on the marks alone the vases are wrong. 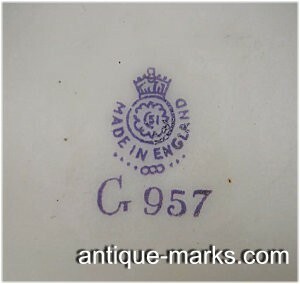 Fake Royal Worcester marks are quite common and these marks are definitely not genuine Royal Worcester marks. Look particularly at the images in the 1916 to 1948 section, which covers the period that Worcester date cyphers would date your pieces. Note the Worcester crown is completely wrong, as is the center section. Given the marks are so wrong I would also have to doubt the authenticity of the Stinton signature.